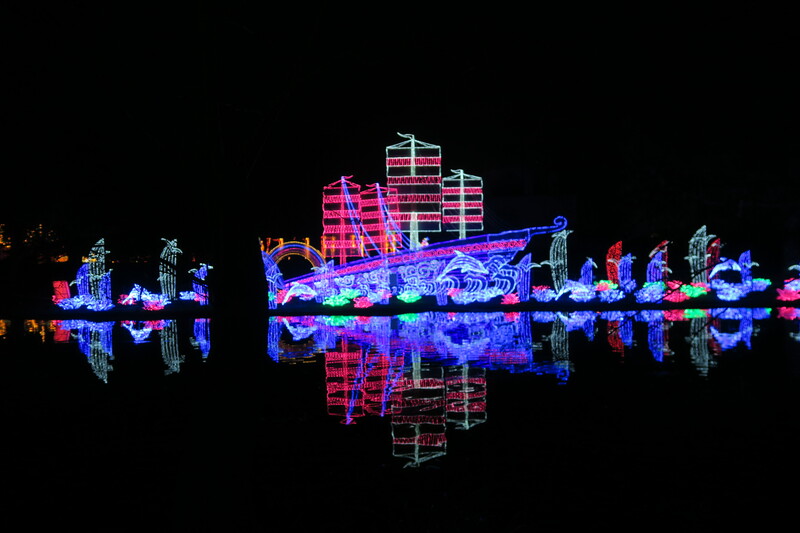 Magical Lantern Festival from 19 January to 26 February 2017 in Chiswick Gardens, London. Love art with a difference then you won’t want to miss The Magical Lantern Festival with it’s dazzling fusion of art, heritage and culture. Illuminating outdoor installations of beautifully sculpted silk lanterns in many various forms from people to buildings. This is the festivals second year in London as the UK prepares to celebrate Chinese New Year of the Rooster 2017 and the cultural significance surrounding this years spectacular event. The theme for this year’s festival is: ‘Explore The Silk Road’. Visitors will discover various magnificent life-sized and oversized lantern scenes, which represent and highlight this significant route of trade and culture from Europe to Ancient China. The Silk Road Festival journey begins with a 15-metre wide lantern of London’s Houses of Parliament. Visitors continue their tour by exploring lanterns related to the Silk Road representing Europe, Central Asia, Arabia, Egypt, Persia, India and Ancient China. At the end of your magical walk you will come to the entertainment area which includes an array of international range of foods and beverage vendors, festival merchandise, a fully equipped synthetic ice-rink, an authentic ice bar, virtual reality gaming experience and a mini funfair and games. So there is fun for any age. To fnd out about their latest show and to book click here. Thanks to Magical Lantern who let some of the community members of Love Pop Ups London come down to experience the spectacular delights of the colourful lanterns. Read all blogs/reviews from the comments section below. Magical lantern show really is magical!! I went photography overload on this one!! It is much bigger than I’d ever imagine and although it was freezing cold (thanks for the warning Joanne Mortlock!!) I was determined to make it to the end!! The hub of food stalls at the trek marked the end of an illuminating eye popping experience! Honestly it’s definitely a place to visit if you haven’t already but February is probably the better month to do it in as it’s not so arctic cold then! Thanks for the tickets Jo!! The day I visited with friends was EXTREMELY cold. So cold that the lake had actually frozen in some areas. As it is open air, I suggest you wrap up extremely warm and wear comfortable and waterproof footwear as it was quite muddy along the pathways. Some of the lanterns were quite cute and pretty. ie the giant panda, cartoon styled Chinese opera characters and rooster in an egg shape. In addition, I liked the elephant made out of crockery as it was pretty clever. But some were not to my taste, because I am Chinese, some of the lanterns shaped like people and buildings reminded me of “gifts” that you would burn for the dead, hence my friends and I skipped past those pretty quickly. Overall, it was an okay night out but I felt there was less variety and was quite short in comparison to Kew’s Christmas lights. The lanterns were well constructed and brightly lit, we started our journey in London with the Houses of Parliament and the guardsmen. The trail moved on into Northern Africa and through the deserts featuring camels and Arabic styled buildings. As we walked around the lake we had giant flowers next to the path with lanterns representing Morocco and a Buddha. To read further go to my blog site. us back to childhood. A childhood where rain mattered not. tip…..wear waterproof boots as the way can get rather muddy.